On March 22, Rainer Kuschnig of the Graz University of Technology in Austria was doing his daily check of the nanosatellites in the BRITE Constellation Project – a Canada-Austria-Poland collaboration – when something caught his eye. What seemed to be a very bright star, one which had not been there the day before, appeared on one of his screens. “I’ve never seen anything like this,” wrote Kuschnig to the 12-member BRITE team, which includes Slavek Rucinski, professor emeritus in the department of astronomy and astrophysics at the University of Toronto and the man responsible for inventing the nanosatellites that spotted the phenomenon. 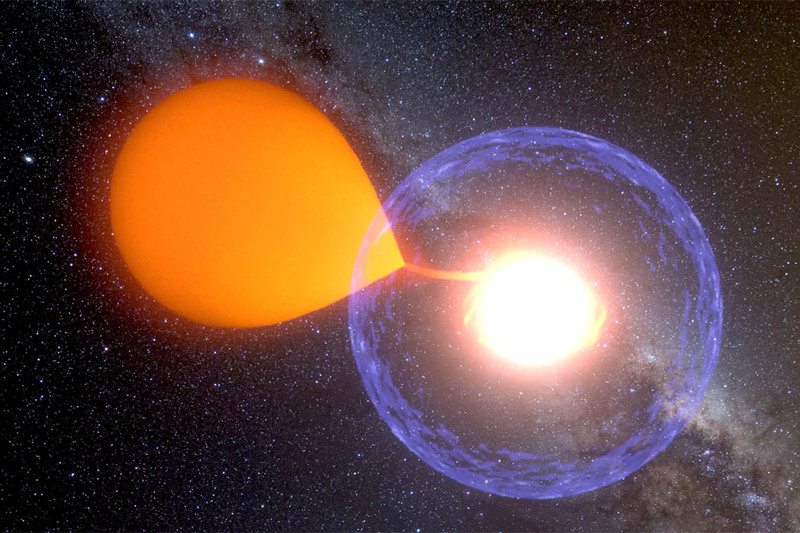 The star was subsequently identified as a nova, a massive explosion that occurs when one small, dense star acquires mass from another closely located star until the overload results in a violent burst of light and energy. Only five to 10 novas are observed every year, making them a rare occurrence highly sought after by astronomers. But this nova in particular was unique for two reasons. First, it was caught much sooner than usual. The early stages of a nova are often observed with insufficient frequency and accuracy because “we simply don’t know where to look," says Rucinski. Second, the BRITE team realized just how exceptionally good Rucinski’s equipment was. His nanosatellites – weighing between one and 10 kilograms, compared to the 1,000-plus kilogram weight of regular-sized research satellites – were initially built with budgetary constraint in mind. They were “cheap to launch and cheap to develop,” says Rucinski (pictured left). When Rucinski first began to consider the potential of nanosatellites in the late 1990s, very small satellites – under 100 kilograms – were a rarity. But he and Robert Zee, the director of the Space Flight Laboratory at U of T’s Institute of Aerospace Studies (UTIAS), were envisioning something new and unprecedented in the world of astronomy: a small, lightweight satellite that could focus exclusively on massive stars with very high luminosity – “the brightest and rarest stars in the sky," he says. This initiative followed another Canadian success, the small satellite MOST (a microsatellite with a mass of 70 kg), which Rucinski proposed to the Canadian Space Agency together with Kieran Carroll and was operated from 2003 to 2014. Rucinski and the BRITE team have opened up a new domain of miniature, low-cost spacecraft – BRITE nanosatellites that cost under $2 million each, much lower than the hundreds of millions it costs to build and launch full-sized satellites. These nanosatellites boast unprecedented precision that can explore the minute structure, variations and instabilities of bright stars, a key aspect of understanding the materiality of the world around us, he says.